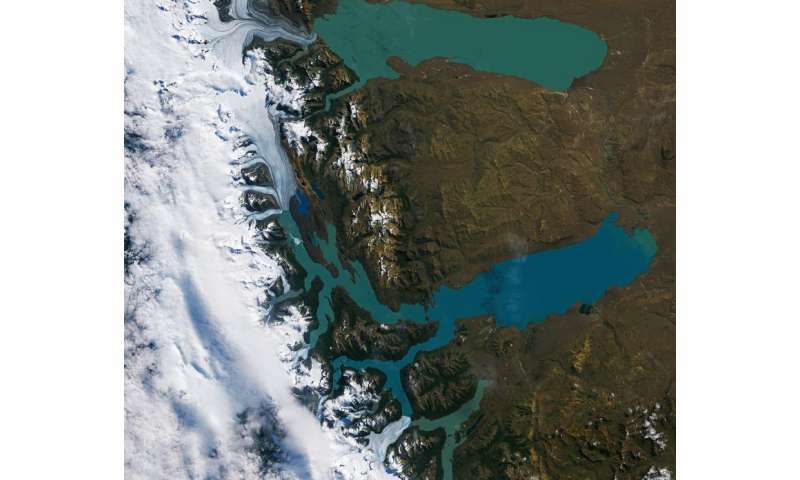 Part of the Southern Patagonian Ice Field – the world's second largest contiguous extrapolar ice field – and two lakes are pictured in this image of Argentina's Los Glaciares National Park. Once the dam is formed, water and ice commence a kind of duel: water from melting glaciers drain into the trapped section of lake, and the force of the rising waters inevitably becomes too much and the ice dam gives way to crushing lake waters trapped behind it, finally breaking apart. This process first occurred in 1917, submerging a several-hundred-year-old forest, and has occurred over twenty times since then.